Golden Retrievers were originally bred as sporting dogs. 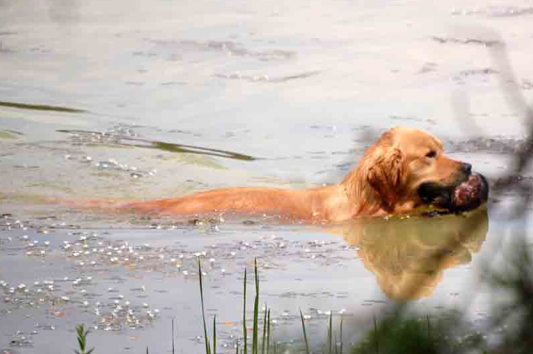 Participation in field events is a way for Golden owners to develop and demonstrate their Goldens' retrieving instincts and to help maintain those instincts in the breed. The official American Kennel Club "Standard for Golden Retrievers" describes the Golden Retriever as "primarily a hunting dog." The LIGRC is committed to keeping these instincts in the breed. The club offers many opportunities for training and testing those abilities: We hold training sessions weekly weather permitting, a spring and fall AKC Hunt Test, Fun field events for novice and experienced handlers to enjoy the field and learn what retrieving is about, GRCA Working Certificate tests and AKC judges Seminars as needed. Dogs which pass the GRCA tests earn the titles Working Certificate (WC) or Working Certificate Excellent (WCX). Entry Express is dedicated to hunt tests and field trials. This page has been viewed 184 times since Tue Jan 22 02:53:18 2019.